John R. Williamson, the dean of the faculty of law at the University of New Brunswick, joined eight other UNB Law alumni in being sworn in as Queen’s Counsel on Monday, Oct. 24, a distinction conferred during a ceremony at the New Brunswick legislature. Lieutenant Governor of New Brunswick Jocelyne Roy-Vienneau presided over the afternoon ceremony. The designation of Queen's Counsel recognizes members of the Law Society of New Brunswick who have demonstrated excellence in their service to the legal profession for at least 15 years. 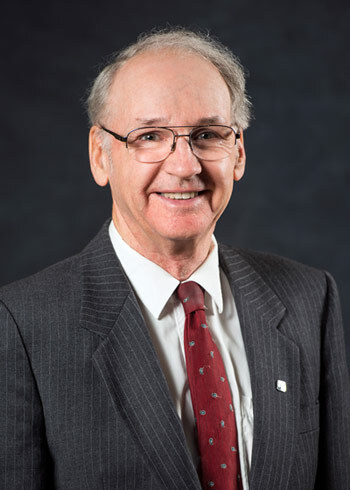 A member of UNB’s faculty of law for more than 40 years, Dean Williamson began his career at UNB in 1974 after receiving his master of laws from Harvard Law School. Dean Williamson has undertaken law reform projects in Atlantic Canada relating to the enforcement of money judgments, including proposed draft legislation for the implementation of recommended reforms. Draft legislation prepared for the government of Newfoundland and Labrador was adopted as the Judgment Enforcement Act. His research has focused on bankruptcy and receivership, commercial law, and debtor-creditor law. With articles, published in academic and professional journals such as UNB Law Journal and the Solicitor’s Journal, his work is regularly cited by the courts of New Brunswick. Dean Williamson’s connection with UNB began in ‘71 with a bachelor of business administration. In ‘73 he obtained his bachelor of laws and was called to the Bar of New Brunswick. He joined the faculty of law as assistant professor in ‘74 and was promoted to professor in ‘85. With half of his career at UNB spent in leadership roles, he has held the position of associate dean, acting dean, interim dean and dean of law.